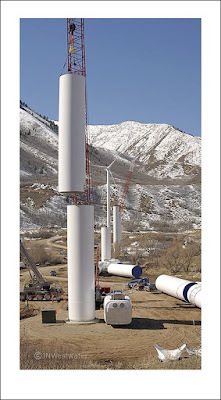 The Spanish Fork Wind Farm is taking shape! It's the 1st urban wind farm west of the Mississippi and only the 2nd urban wind farm in the US. 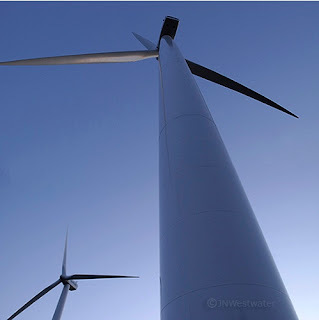 The turbine towers are nearly 300' high and each propeller blade is about 148' long. Each of 9 turbines will generate about 2.1 megawatts of electricity. Like solar and geothermal, wind power is "free," safe, clean, renewable and a source of energy independence. Unlike coal, wind power does not poison the air, the water and human beings, it does not contribute to global warming or black lung disease, it does not result in the the deaths of thousands of miners every year or destroy the surrounding environment, as is often the case with "mountain top removal" and strip mining. The world will be much better off if it moves quickly toward clean, safe, renewables and away from dirty, polluting, harmful, hazardous, diminishing fossil fuels. Recently, a tour for Sierra Club members took place where we were introduced to these clean white giants. It was quite impressive.